As you know, I'm slowly going through the Friday the 13th series chronologically after going out and purchasing the entire series recently on DVD. Yea, I've seen "most" of them before and remember bits and pieces of each one, but it's honestly been many, many years since I've had a mature viewing of any of them and what better time than now to finally get a chance to sit down and watch them all with fresh eyes. So now we're talkin'. Jason Voorhees more closely resembles the guy we've grown accustomed to in all the following films and now he's finally got his trademark hockey mask. Funny thing is that this film is supposed to take place literally a day after the last entry, Part 2, yet Jason seems to have grown and aged considerably within that one day. Either that was an insane oversight on the filmmakers part or they decided to switch gears and have Jason be more of a physically imposing monster instead of the hillbilly looking country boy with a bag over his head from Part 2. I actually liked this one more than Part 2. For me, Part 2 felt almost like a remake of the original and at least here, though there are plenty of homages to Part 1 that can drive you crazy, it does add a few new and original elements to it that for me, made it stand out more than Part 2 in terms of originality. As we all know by now, this came out when we had a small 3D explosion back in the early 80's, and this time the filmmakers wanted to capitalize on the craze and offer something new to the franchise. In that respect, it succeeds, but only slightly. As I mentioned in my review of Part 2, I'm not a fan of director Steve Miner's (House, Warlock) work. When I saw that he was also director of this installment as well, I was a little apprehensive because as a visualist, I just don't see any talent there. His work in Part 2 was so subpar and for me, completely uninteresting. But as Michael Bay had to do with Transformers: Dark of the Moon, he was forced to be a little more creative with the camera work and a little more "stable" since a lot of the 3D gimmicks involved shooting or pointing objects directly at the camera lens. Hey, I'm no fan of fads or gimmicks when it comes to filmmaking, but somehow it all worked and he was able to craft a much more professional, atmospheric and interesting looking horror film as opposed to his previous effort from the year before. Don't get me wrong, a lot of it looks so hokey and annoyingly staged, but for the most part it works. Again, despite warnings, stories and rumors, a bunch of horny teenagers head out to a cabin which just so happens to be close to Camp Crystal Lake for a weekend of fun. What is it with these kids and camps? If all they're interested in is getting it on, then just go get a room! Jason makes his presence known pretty quickly by killing a couple at a store in the opening sequence, but it's a while before he starts killing the group off one by one. There doesn't seem to be any real reason this time either. Last time it was because the teenagers were too close to his home, but here he's just portrayed as more of an unstoppable and even slightly clever killing machine who just seems to be out for a kill. A lot of Friday the 13th Part 3 works so much better than Part 2 did. The atmosphere and sense of dread lurking behind every corner is amped up to 10 here, and though most of the teenagers are pretty unlikable, some of the kills are pretty awesome. Again, a lot of it has to do with the use of the 3D gimmicks, but even in 2D having stuff flown at the camera is fun to watch. Director Steve Miner also creates a much more fun film for me. I know it's a horror film, but I just had much more of a better time with this one. The pace is faster, the girls are prettier, and as opposed to most of Part 2 taking place at night, most of Part 3 takes place during the day. Jason looks much bigger, scarier and meaner. The kills a little more creative. 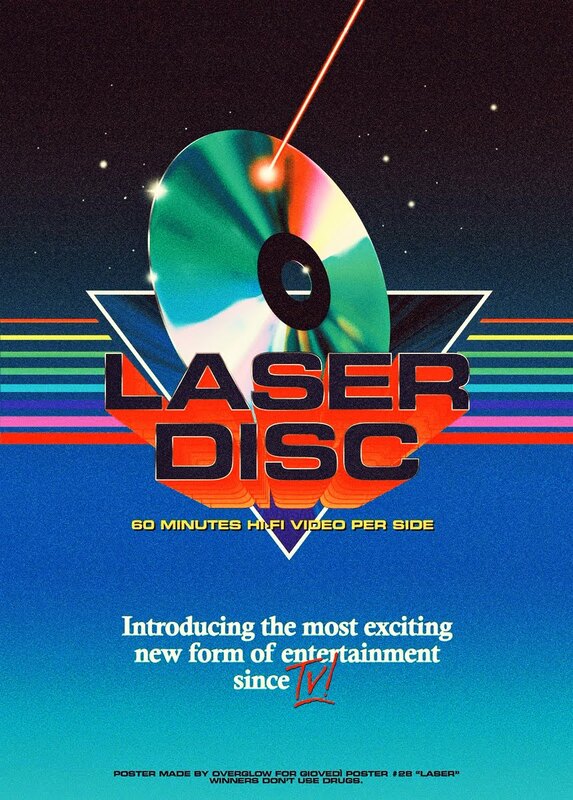 And the added element of watching this in cheesy 80's 3D only adds to the kitschy camp factor. Yes, if you purchase the deluxe DVD, it comes with both the 2D and 3D versions complete with 3D glasses. How cool is that?! Just watch the first 15 minutes of this great film. If the first 15 minutes doesn't grab you, then I don't know what will. After the intro sequence where were shown that Jason is still alive, the film goes into this incredibley cheesy but wholly fitting 3D title sequence complete with equally absurd and oddly out of place title music that sounds like something from the late 70's. You gotta see (and hear) it to believe it. We're also introduced to a biker gang where one of it's members actually offers Jason somewhat of a challenge, but only really adds as a distraction to some of the films enormous plot holes and continuity issues (of which there are plenty). My main beef, which they "never" explain, is why Jason looks so drastically different (even wearing different clothes than in Part 2), from the previous film if only one single day had gone by since the events of the last film. Hey, he looks cool and all, but I'd still like to know the logic in all that. There's also a scene (the last scene to be exact) that plays homage to the last scene of Part 1 when Alice is in the boat in the lake at the end of the movie and a young Jason leaps out from the water and pulls her under. This scene at the end of this film is so stupid and makes no sense whatsoever. I guess the logic would be they needed to throw another scare in there, but come on! I wish I was a little older when these came out in the theaters back in the early 80's. Being 8 I doubt my parents took me (I would have to wait for VHS), but this was such a fun time in terms of horror films. 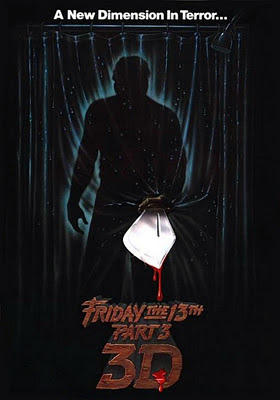 Beginning with the first film in 1980, there was a Friday the 13th film released every single year in the theaters until Part 7 took a two year break and didn't hit theaters until 1988, when it should have hit theaters in 1987. How fun is that?! To know that pretty much every year we were sure to get a Friday the 13th film. The good ol' days. For me, this is the film that really got me into the Friday series. I still think Part 4: The Final Chapter will always be my favorite, but in terms of the older films in the series, Part 3 would come in a close second. Great review! This one is my favorite Friday. I think it has the strongest Final Girl segment of them all as the final twenty minutes are genuinely scary. This one and Part 1 I think are the only films in the series that were actually suspenseful. I can't wait to read your reviews of the rest in the series. Yea, I had a lot of fun with this one, especially after being underwhelmed with Part 2. Above all though, Jason get's his hockey mask and it finally looks and feels like an honest to goodness Friday the 13th film. I'm curious and anxious to get to Parts 5 through 8 and see if they are as cool as I remember. Agreed this is top notch Friday 13th action. Watched it in somewhat fuzzy 3D the other week. The dream bit with Jason at the window is one of few bits from the whole series to genuinely frighten me. So far, this was the best one out of the first 3. I watched it both in 2D and 3D and you're right, the 3D stuff was mostly fuzzy at times. lol. But it was a blast to watch. Imagine that we actually used to "pay" to see them that way in the theaters back in the day. lol. And you are right, that was a genuinely creepy moment. I really liked how they made him much scarier and physically imposing this time compared to the last one. It made a world of difference.